The Southeastern Society of Plastic and Reconstructive Surgeons recently hosted their 28th Annual Breast Surgery Symposium for plastic surgery in Atlanta. Atlanta plastic surgeon Dr. Tom Lintner says the recent PIP implant scare in Europe was a hot topic at the conference, and adds that he has always gone to great lengths to reassure his patients of the safety of 3rd generation gel breast implants in Atlanta, which virtually all of his patients prefer. 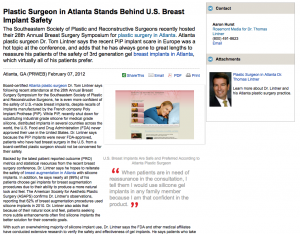 Board-certified Atlanta plastic surgeon Dr. Tom Lintner says following recent attendance at the 28th Annual Breast Surgery Symposium for the Southeastern Society of Plastic and Reconstructive Surgeons, he is even more confident of the safety of U.S.-made breast implants, despite recalls of implants manufactured by the French company Poly Implant Prothese (PIP). While PIP, recently shut down for substituting industrial grade silicone for medical grade silicone, distributed implants in several countries across the world, the U.S. Food and Drug Administration (FDA) never approved their use in the United States. Dr. Lintner says because the PIP implants were never FDA-approved, patients who have had breast surgery in the U.S. from a board-certified plastic surgeon should not be concerned for their safety. Backed by the latest patient reported outcome (PRO) metrics and statistical resources from the recent breast surgery conference, Dr. Lintner says he hopes to reiterate the safety of breast augmentation in Atlanta with silicone implants. In addition, he says nearly all (99%) of his patients choose gel implants for breast augmentation procedures due to their ability to produce a more natural look and feel. The American Society for Aesthetic Plastic Surgery (ASAPS) confirms Dr. Lintner’s observations, reporting that 62% of breast augmentation procedures used silicone implants in 2010. Dr. Lintner also adds that because of their natural look and feel, patients seeking more subtle enhancements often find silicone implants the better solution for their cosmetic goals. A graduate with honors of Georgetown University, Dr. Tom Lintner earned his medical degree from Emory University, where he also completed his General Surgery and Plastic Surgery residencies. He is board-certified in Plastic and Reconstructive Surgery, a Fellow of the American College of Surgeons, and a member of the American Society of Plastic Surgeons, the American Society for Aesthetic Plastic Surgery, and several other professional organizations. Dr. Lintner is also an active member on staff of the Wellstar Kennestone Hospital, where he sits on the ER services and Medical Staff Credentialing Committees and served as Chief of Plastic Surgery in 2005. With two locations at 711 Canton Road, Suite 400 in Marietta, GA and 120 N. Medical Parkway, Suite 200 in Woodstock, GA, Dr. Lintner’s practice, Advanced Aesthetic Surgery, can be reached at (770) 771-5151. He can also be contacted online via the website tomlintnermd.com or facebook.com/tomlintnermd.